smaller. It is an odd thing and I'm not sure where the bug is at this point. I purchased Sure Cuts Alot (sorry, but they added the ability to create .fcm files for the Brother SNC so I snapped it up) but now I've been working in SCAL for a bit trying to learn it a bit more and svgs that are created in SCAL do not have the same problems opening in SSDE. They don't need to be resized like they do if I save the svg in MTC and then open in SSDE. So what is the problem, why is it that MTC's svgs open in the wrong size in SSDE, but open correctly in SCAL? If I open the svg created in MTC in SCAL it opens at the same size as the MTC created file, so it's total confusion. I get that it's a SSDE error, and I have written them about this, but I don't think Silhouette cares to fix the bug that poses this problem, so I'm wondering if their is a work around for this problem that I can work in MTC so that Silhouette opens the files without having to be resized. Since so many other softwares are now adding .fcm, (2 embroidery software editors Sew What Pro, Embrillance, and SCAL all create fcm) I'm hoping you will also reconsider your position on adding the .fcm format and allow that to be created in MTC also. 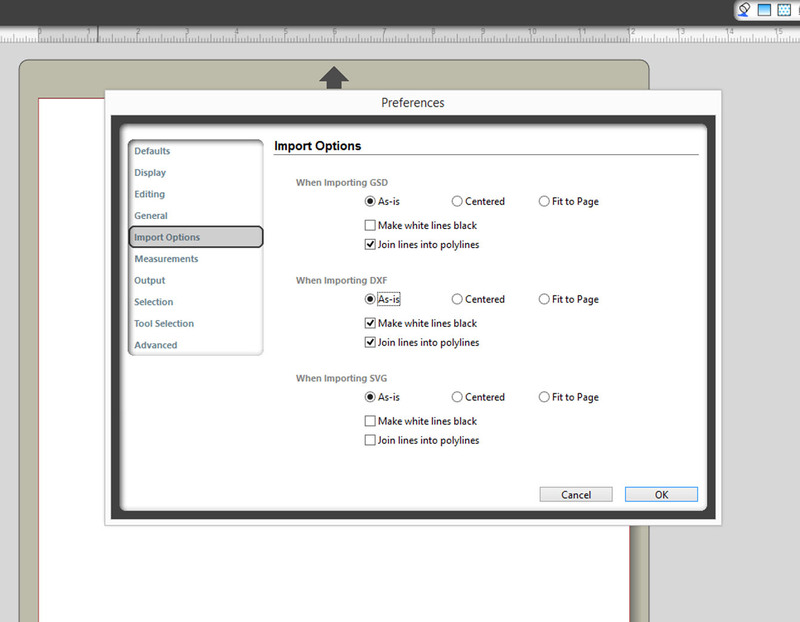 Do you have your Silhouette Studio preferences set to import SVG files at actual size? File/Preferences/Import Options. Be sure to check AS IS for all of the file types. As discussed in the Webinar last night, you can resize your MTC files to 125% and they should import correctly into Silhouette Studio Designer Edition. That software assumes that the file came from Illustrator, which exports SVG files at 72 DPI. SCAL allows you the option of exporting in various sizes. MTC imports all SVG files at their proper sizes, and exports at 90 DPI. As discussed in the Webinar last night, you can resized your MTC files to 125% and they should import correctly into Silhouette Studio Designer Edition. That software assumes that the file came from Illustrator, which exports SVG files at 72 DPI. SCAL allows you the option of exporting in various sizes. MTC imports all SVG files at their proper sizes, and exports at 90 DPO. I wanted to note which webinar date was the one Julie notes as being "last night" - Julie means the January 13 2015 Webinar and this discussion was at the 01:18:43 timestamp. @MeFlick...now everyone is confused...the webinar was Tuesday, January 13th. @cpeep, yes, my Silhouette settings are correct. However, this problem should be addressed. While I know that svg imports at the correct size into mtc, I'm not importing a svg into MTC, I'm importing a pdf, then doing the work needed to it, and exporting as svg. Thus, when it goes into Silhouette, I always have to resize it. This is not the case with SCAL. Even if I take the svg (made in mtc) into Scal, the svgs that got an offset added to them) always need to be resized, but the others that didn't get a offset didn't need to be resized. However in Silhouette, they always need to be resized. I don't need svgs for myself, I have MTC and SCAL, of course I can cut from those softwares, but people who get my patterns who only have Silhouette need to have a accurate size for the svg. Yes, I can give them the sizes from MTC, but why should I have to go to this extra step. So, now I take those same svgs, import them into SCAL, and resave them, then, because of the "save features asking about the dpi to save to" they open at the size needed in Silhouette. No need to resize, accurate every single time. So why? I get it, the problem is between MTC and Silhouette. While I prefer MTC to work in, even against SCAL, I'm not going to continue using MTC if I have to go to the extra trouble of savings svgs then taking them to SCAL to get the proper sizes. I'll just learn SCAL so I can do everything in that. It's pretty sad, I really love MTC, but I can't afford to give away my time to software that has bugs in it and hasn't been updated in over a year. I've owned SCAL less than 2 months and it's already had 5 or 6 updates. If MTC ever gets updated, they should add the ability to save the svgs in the same format as illustrator or for Silhouette users. Let's face it, Silhouette is selling a heck of a lot of cutters. If it gets around that MTC isn't saving svgs at the accurate size against a competitor like SCAL, then guess where your customer is going to go.. over to SCAL. I have already updated my blog with the bug in MTC and remarked they'd be better off buying SCAL until MTC is updated. I hated doing that, but I want my customers to have proper working tools. With SCAL now creating fcm's as well for the Brother SNC, your going to lose customers anyway. I will try the 125% resize, but I still question why should I need to resize just for silhouette, if the svg files couldn't have an updated feature just to fit for Silhouette so this step doesn't have to be taken. There is no error in the way MTC imports or exports SVG files. Having the option to set the export DPI size would be a useful in Make The Cut. When MTC is in the standart and using the full standard, it can´t be the problem of MTC to solv the problem and it´s not a bug. Also it would be nice when we could set the dpi in MTC but on the other hand it takes a few seconds to save a svg in 125%, so what ? Then, why should MTC make an update when there are no bugs ? I just see some whishes for "nice to have". Some of them will come in the future some won´t because they are so difficult to implement that it make no sense. For me it looks like the maker of MTC take theire time to make a new version when needed or bring some new features and then it works. Others, just in my personal point of view, abuse the users as beta tester and have a update twice a month. It´s ok if someone don´t like a programm or use a other software because he likes the workflow or some special feature but you have to be fair and don´t blame someone´s work when there is no mistake. You might be right that fcm is a reason for people to use a different software in future and I think the people around MTC will think about fcm implementiation but it has to make also sense from the economic view. MTC has come a long way from when it was first released five years ago. It was never intended to be a graphics converter program, those option have been added as requests from users. It was never intended to be an svg file creator, adding the ability to import and make svg files from shapes was added as a request from users. I know that Andy does the research and follows the published standards for file types, other software developers seem to be less diligent (its not only Silhouette, if I understand it correctly, the Pazzles software has the same problem?). I agree with Julie and others, having the option to choose the export size is a great idea. However, if someone is developing files for a particular software, why don't they nag those developers to have an option in their software when importing svg files if their software is not conforming to standards??? I believe if I remember correctly, Andy has this ability in one of the earlier versions of MTC, until he made the program more "intelligent". Just a comment about SCAL. It has taken 2 years for the SCAL software to start to catch up with the featues of MTC. They do have a few new features, but those also come with an added price. All MTC updates have been free. For the single low cost of our original purchase, we have an outstanding set of design tools for many different cutters, and we have a gallery of nearly 12,000 user contributed cutting files at our disposal at no extra charge. If you decide to switch to SCAL from MTC for your design work, I look forward to hearing your feedback as to how you like working in that software. I have both, and I occasionally use SCAL for file conversions, but I keep coming back to MTC.